What Are Accessible Homes of Austin? Just what are accessible homes of Austin? Accessible homes of Austin provide homeowners with a means to stay healthy, independent, and safe. Architectural barriers have either been removed during elder construction or were never a part of the design for increasing accessibility. The accessible home stands as the defined course to the universal designed home. The accessible home represents a wonderful place where people with disabilities can live comfortably and safely. Everyone ages differently and has different needs and wants. The factors that constitute the aging in place market for all individuals are based on a persons genetic makeup, their lifestyle including the choices they have made while living their life, and their environment. These factors have brought about the need for universal design. This is the design of products, services, and environments that are usable by as many people as possible regardless of age, ability, or situation without the need for adaptation or specialized alterations. It provides for the greatest safety and access for any home guests or occupants and is undetectable when done well. Since so very few homes share the accessibility offered by universal design, to satisfy the needs of a particular household member brought about by an accident, an illness, or simply the aging process there will always be a need for customized accessibility features. This will be accomplished by a CAPS accredited remodeling professional producing a truly functional design. This same competent design/build home remodeling company who understands and practices aging in place home modifications in Austin should carry out the work to fit the design and insure your safety and accessibility. A certified aging in place specialist will be listed in Washington on the NAHB CAPS listing. There are three segments that are served within the aging in place marketplace. The first segment includes those clients without urgent needs. They have no immediate health issues and simply have a preference for universal design techniques. The second segment focuses on a group of homeowners with progressive health condition needs. These people have a chronic or progressive conditions like MS requiring special modifications to their home allowing them to age in place. This group of people will face a time of urgency at some point in their lives as their mobility needs evolve. The third sector involves those people who have undergone traumatic health changes that necessitates immediate modifications to their home in order to age in place. Only aging in place home remodeling in Austin can accomplish the home modifications for all three sector's needs mentioned above. As our society evolves away from institutionalized care, making a home more comfortable for both older adults and their visitors can have an immediate benefit on the comfort and lifestyle of the adult child. The concept of the accessible home has evolved beyond the basic grab bars and ramps to one in which accessibility is built into the basic design. Universal design makes living in a home easier for people of all ages and abilities. Accessible design can be both beautiful and functional and never needs to have any institutional appearance. As our aging baby boomer population ages, the need for accessibility in the home is becoming ever more important. Our new way of viewing the basic home in our society and our antiquated architecture is giving way to a revolution in home design. Ordinary homeowners with extraordinary challenges can partner up with CAPS design professionals, architects, and their own families to create homes to restore capabilities, independence, and grace to daily living. Tweet this! The reality is that accessible homes will be needed at sometime in all our lives whether for ourselves, our family members, or our guests. This in itself defines the Aging in Place concept and it's associated CAPS accreditation, which is a nationally registered credential offered through the NAHB. It's function is not only to keep people in their homes longer but to provide safety and independence to all homeowners. As in the kitchen in the above photograph, the accessible kitchen is comfortably sized for a clear turning radius and to avoid backing up for an approach. It must be tailored to the homeowner's abilities and interests. Pull out shelves expand work spaces at activity centers, while roll under access is given underneath the work areas for the stove, prep, and service areas. 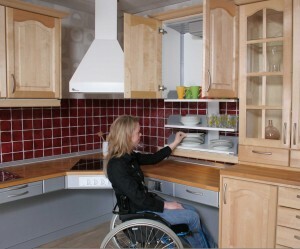 A higher and deeper base cabinet kick space area provides better forward wheel clearance for the wheelchair to enable the user to get closer to the cabinet work space for increased reach distances. Raised dishwashers offer easier access to dishes and lowered microwaves and other appliances solve other reach distance problems making it easier to live with a disability. Open storage areas without doors to interfere with access is definitely a better solution. A successfully designed kitchen isn't about cabinet style or the composition of the counter top and is more about the ways the design can support the user's personal needs. Human problems must be solved using correct designs. People who have become seriously injured, people living with a debilitating disease, people with sensory limitations or intellectual limitations, and last but not least the people who are planning to stay in their homes for as long as possible all need accessible homes. The need for dealing with disabilities during elder construction empowers us all to ensure that we create environments wherein people can function effectively. How are you planning for your future when it concerns your home?